Is Radical Management Really so Radical? 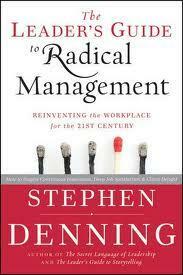 At first glance Steven Denning’s new book struck me as offering revolutionary suggestions to organizational life-as-we-know-it: after all, it’s called The Leader’s Guide to Radical Management: Reinventing the Workplace. The workplace certainly needs to be reinvented—and Denning is a well-known author who has worked with many large organizations. Recently he and I teamed up to launch a study group of organizational leaders in New England to introduce radical management. It has a strong and important message. Yet, with all due respect to Mr. Denning, all seven core concepts are quite humanistic and perhaps not so foreign to many people. Given how long these humanistic concepts have been around, why is it that in 2011 we consider radical management, a new and innovative concept to breathe life into workplaces wrangling with survival issues? With such instability in organizational life today, one must wonder how radical must we be to change the organizational trending? In other words, what must be done to cure the seemingly shortened ‘shelf-life’ of Fortune 500 organizations? Well, as we introduced his concepts, the reinvention of work became closely linked to the concepts we cover at Saybrook University in course work. Accordingly I have crafted a list of some rules of thumb to offer leaders to expand on (but not replace) Denning’s interlocking principles—bridging his concepts to humanistic studies, topics and approaches. I posit that organizational sustainability stems in part from moving these philosophies into the daily practices of organizational leaders and followers. “Focus the organization on delighting clients” (Steven Denning) which means “become more aware of the role of a collaboration culture in supporting the mission you joined to serve fellow human beings” (Dennis Rebelo). “Work in self-organizing teams” (Steven Denning) meaning “focus on natural formation versuscontrol and command styles of the carrot and stick era of management so that you can experience joy at work” (Dennis Rebelo). “Operate in client driven iterations” (Steven Denning) or “engage in a dialogue in the Bohmian-spirit to suspend judgment en route to understanding others” (Dennis Rebelo). “Deliver value to clients” (Steven Denning) in other words “work with honor as you promised you would to serve” (Dennis Rebelo). “Foster radical transparency” (Steven Denning) which is to say “graciously accept the sharing and critical thinking that stems from diversity” (Dennis Rebelo). “Nurture continuous self-improvement” (Steven Denning) because “people are naturally inquisitive and so let the human endeavor at work encourage learning” (Dennis Rebelo). “Communicate interactively” (Steven Denning) which is to say “dialogue versus monologue because no collective wisdom comes from watering down the thoughts of another human” (Dennis Rebelo). To be human means to accept, honor and be able to work with ease and grace despite having differences in thoughts and feelings with other people. To think these concepts are radical is to suggest that we have become subscribers of the carrot and stick management style which doled out rewards or punishments reducing humans to simple creatures. The cost for this subscription leads to stress and discomfort for people and seems to create an organizational culture ripened for failure. To sustain an organization these seven principles need to move from whiteboard to boardroom and beyond. Embodying these principles may offer fading organizations a new way to “be” at work for existing personnel while signaling respect for the human side of work to vendors, affiliates and recruits. When persons are not honored, involved or inspired, a new culture of mediocrity is birthed which eventually takes hold of many good persons. Of course, I suppose we could avoid the notion of personal identity’s importance at work, which unfortunately may reinforce the blind leading the blind routine we witness in constrained organizations. Perhaps being human to get a human back is not a radical concept after all. Let’s not let it be.